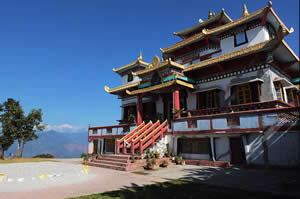 The monasteries or gompas of Sikkim welcome you with an ambience of calmness and peace. The air echoes to the serene chant of mantras, as people pray with flowers and incense, circle the chortens and spin the prayer wheels as the prayer flags flutter across the sky. The various aspects of the Vajrayana worship include mystical mantras, magical diagrams called mandalas and yantras and gestures of the hands during chanting called mudras. The rather mysterious phrase that is chanted by the devotees during their prayers is “Om Mani Padme Hum’, Behold the Jewel in the Lotus. Their main festivals are the masked dances called Chaam. All the monasteries have collections of rare manuscripts, sculptures and paintings done in the Tibetan style. Many of the monasteries trace their history to the three Tibetan monks Lhatsun Chenpo, Karthok Rikzin Chenpo and Ngadak Sempa Chenpo who introduced Buddhism to Sikkim. There are four main Vajrayana orders in Sikkim – Gelug, Kagyu, Nyingma and Sakya while Nyingma is the oldest among them. The monasteries also have images and paintings of the Vajrayana Buddhist pantheon of deities called Bodhisattvas. These are compassionate deities like Avalokiteshwara, Tara, Maitreya, Padmapani and Manjushri. A Bodhisattava is said to have attained six paramitas or ‘perfections’ – generosity, patience, meditation, morality, energy and wisdom and are on their way to becoming a Buddha, or an enlightened being. The stupas in Sikkim are called chorten and devotees visit them to say their prayers and turn the rows of prayer wheels that stand nearby. The chorten differs in architecture from the more familiar egg like shape of stupas seen in India and Nepal. These have a stepped bottom and a curved oval top with a high circular spire above and typically these are a shrine to a saint or contain relics of the Buddha. 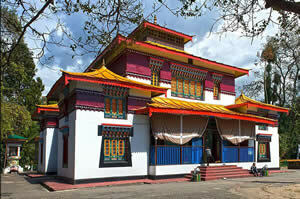 A monastery that is called a vihara in India is called a Gompa in Sikkim. These are centres of meditation, scholarship and have collections of religious artefacts. Most of them are set in scenic locations on hill tops, beside lakes, forests and rivers. The gompas run schools and the monks are involved in the welfare of the people. The pilgrim circuit in Sikkim includes the monasteries of Pemayangtse, Tashiding, Sanga Choeling and Dubdi. Also the Norbugang Chorten, the ruins at Rabdentse and the Khecheopalri Lake. This giant image gleams in the sun in colours of bronze, copper and pink and is visible from far away. It is the 45 metre tall statue of Padmasambhava or Guru Rimpoche who introduced Tibet to Buddhism and he is also considered the patron saint of Sikkim as he is said to have visited the place. 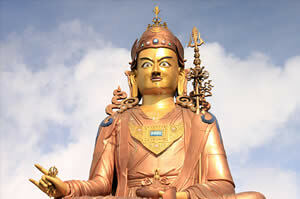 The statue was built in 2004 on a hill at Samdruptse near Namchi and the foundation stone was laid by the Dalai Lama. Guru Rimpoche is depicted blessing the land, wearing a crown and sitting in a meditative dhyana posture on a lotus. Lhatsun Chenpo had built a small shrine. It is one of the oldest gompas in Sikkim and the monks from here used to anoint the kings of the Namgyal dynasty during their coronation. The monastery is 140 km from Gangtok and stands perched on a hilltop and from here one gets a wonderful panoramic view of the Kanchenjunga ranges. Pemayangtse means ‘the perfect sublime lotus’ and it is Sikkim’s premier monastery with all Nyingma monasteries being subordinate to it. The monastery has a rare collection of religious art and on the top floor is a depiction of the heavenly abode of Padmasambhava or Guru Rinpoche as it was seen by the monk Lhatsun Chenpo in a vision. Tashiding or ‘The Devoted Central Glory’ is considered the holiest of the monasteries in Sikkim as it was built in 1716 on the site consecrated by Guru Rimpoche. Legends say that Guru Rimpoche shot an arrow and vowed to meditate where it fell. The arrow dropped where the Tashiding monastery now stands. The monastery is built at a beautiful location on a hill top between the two rivers Ratong and Rangeet as they flow through a valley. Here the famous chorten built by Lhatsun Chenpo called Thongwa Rangdol stands and it is considered to be the holiest in Sikkim. 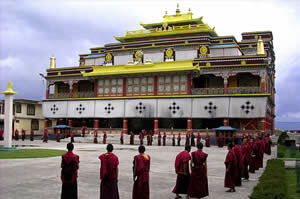 The Rumtek monastery is the centre of the Kagyu sect and the seat of the Karmapa, the head of the Kagyu order. It is also called the Dharma Chakra centre. The monastery was built in the eighteenth century by the fourth Chogyal as a replica of the Kagyu headquarters at Tsurphu in Tibet. The monastery stands on a hill, 24 km from Gangtok and is the largest gompha in Sikkim. 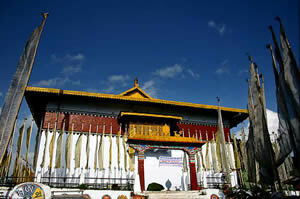 Rumtek is considered an example of the finest of Sikkimese religious architecture. It houses a treasure trove of religious artefacts like sculpture, paintings and rare manuscripts. Built on the Ridge in Gangtok the monastery follows the Nyingma order. Its name means the ‘solitary monastery’ and it still has an atmosphere of quiet contemplation. Enchay was built two hundred years ago and it is the gompa closest to the city of Gangtok. It was founded by Lama Druptob Karpo, who built a small hermitage here for his meditation and the present monastery was built at the site in 1909. The original monastery of Phensang was built in 1721 by Lama Jigme Pawo who was considered the third incarnation of the Tibetan lama Lhatsun Chenpo. The monastery is 25km from Gangtok in North Sikkim. In 1947 the monastery was destroyed in a devastating fire and was rebuilt the following year. It is a large monastery and three hundred monks reside there. The fourth Chogyal went on a pilgrimage to the monasteries of Tibet and came back to build a monastery in Ralong in South Sikkim. The Karmapa, head of the Kagyu order blessed it from Tibet and legends say that grains from the blessing ceremony fell on the ground at Ralong. 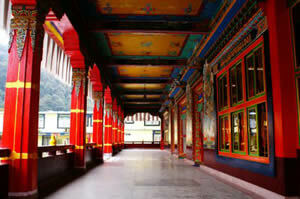 Located 28km from Gangtok in North Sikkim the monastery was built by Chogyal Gyurmed Namgyal. Over two hundred monks live here and they belong to the Kagyu order. The monastery was extensively rebuilt but the ancient murals and frescoes on the walls were all carefully preserved. Located in the Dzongu area of North Sikkim, this is the most remote of the monasteries of Sikkim and it can only be reached after a strenuous trek through steep hill tracks and dense forests. 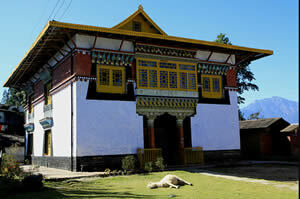 It was built in the eighteenth century by Chogyal Chakdor Namgyal at a time when Sikkim feared an invasion from Nepal. So many precious scriptures were sent to Tolung from other monasteries for safekeeping. The monastery has some of the oldest thangka paintings in Sikkim. Kept in thirteen boxes, all the precious religious objects are taken out every three years for public display and a large number of devotees make their way to this monastery. This monastery located 38 km from Gangtok was built in the nineteenth century by Gyaltse Rigzin Champo who was born in the royal Namgyal family. The monastery stands at a height of 7000 feet in the middle of a scenic landscape with a jungle and a lake nearby. It has impressively sculpted statues of Buddha Sakyamuni, Karma Guru and Mahakala.